The holiday weekend just ahead is always one of my favorites - parades, fireworks, and concerts add up to a great time as we celebrate our country's birthday and freedom. This festive banner made by Bekah Jennings just might be the perfect accompaniment at an Independence Day barbeque; well, not counting the watermelon and potato chips! Check out Bekah's Etsy shop for all sorts of chipboard banners - ready-made or she'll do custom orders for any season, holiday, or event. She says her creations celebrate the beauty and joy of everyday life. To my way of thinking, it doesn't get much better than that. Except maybe it does! When I sent a message to Bekah to let her know I planned to feature her shop, she wrote back offering a 15% discount to anyone who mentions all things paper in the "message to seller" at purchase (custom items excluded). She'll refund your 15% via Paypal. Nice! Since quite a few of you are new to this blog since last summer when I first posted this card, allow me to recycle the idea for a moment. Strips of quilling paper were used to make paper lanterns. Aside from the birthday example, it can do double duty as a summer party invitation... De"light"ed to invite you. 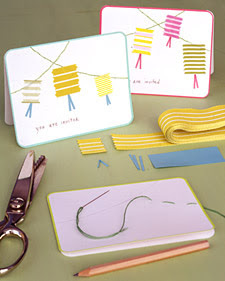 And this lantern card from Martha Stewart's team that features grosgrain ribbon and stitching looks like a lot of fun to make too. That banner is wonderful. The quilled lantern card is really cute. I just love coming here and seeing all the great things you post. Have a great day. Thanks so much - happy weekend! Lanterns made from quilling paper is such a great idea. Looks beautiful! Happy 4th July Ann! Love the banners and your red, white and blue themed card.Enjoy your weekend. Hope your Birthday is filled with much happiness! Here's to many, many, many more happy, healthy years filled with tons of paper art!! Thanks for bringing us all of the paper artists...is a true joy to see!! Aw, thanks everyone! Knowing I have such enthusiastic readers makes blogging so much fun.